One week passed by without any blog post which left an inhibiting sense of guilt in me. On the other hand, a prudent decision made to post one recipe per week seemed cumbersome. 'Well, I have several reasons to justify the passive mode' my brain tried to mitigate the situation. But I was reminded to circumvent the frenzied schedule accompanied by stupendous laziness and post something by the weekly fb page manager notification that warned my inactivity. That was a boost to revitalize the blogger in me. My hubby, lil Noah and my Mom share their birthdays in the month of March. So March is special for me and their birthday falls mostly around the great lent time. Following the tradition of great lent, we usually give up non-vegetarian food during the 50 days period. So it is a challenge each year to bake eggless cakes for their birthday. But I have used gelatin, which is an animal product in this recipe. You could very well use agar agar instead of gelatin if you want. 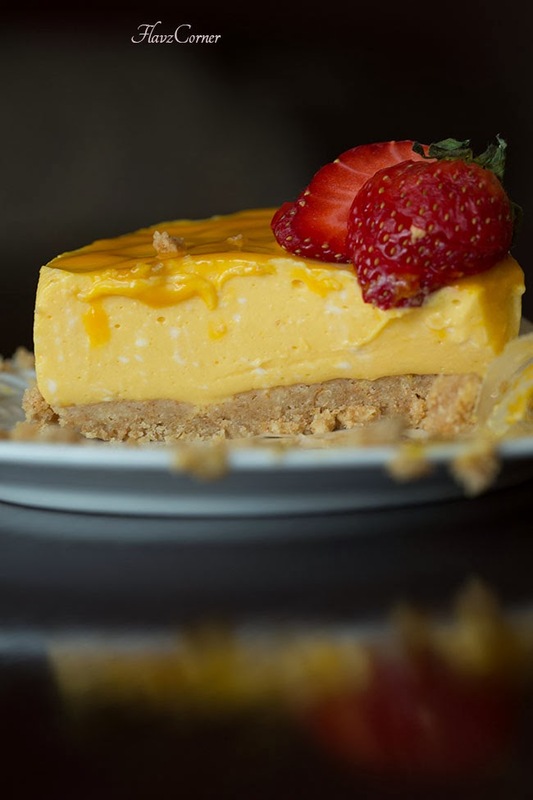 This year I planned ahead and wanted to bake the Mango Cheesecake. Mango being my hubby's favorite fruit, I knew that he will be delighted to see the surprise cake. Take a 6'' round spring form pan and line the bottom and sides with parchment paper or wax paper. Mix 1/3 cup melted butter with 1 1/2 cup crushed graham crackers till everything is wet. Press the graham cracker butter mix on to the bottom of the spring form pan with your fingers to form a firm base for the cheese cake. Microwave 1/4 cup water in a microwave safe bowl for 1 minute or till it boils. Add the gelatin to the hot water and mix till it dissolves completely. Add the gelatin mix to 3/4 cup of mango puree and keep it aside. 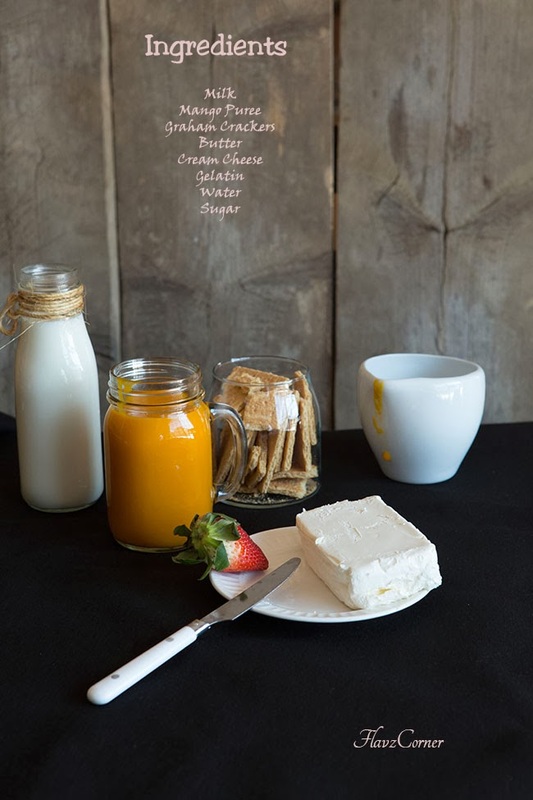 Blend cream cheese, sugar and milk in a blender till everything is mixed well. Now add the mango gelatin mix to the blended mix. Blend for 20 seconds. Pour the mix over the graham cracker base. Cover with a cling wrap and refrigerate for minimum of 2-4 hrs or over night. When the cheese cake is set and ready to be served, gently release the cake out of the spring form pan. Peel off the wax paper/parchment paper from the sides. 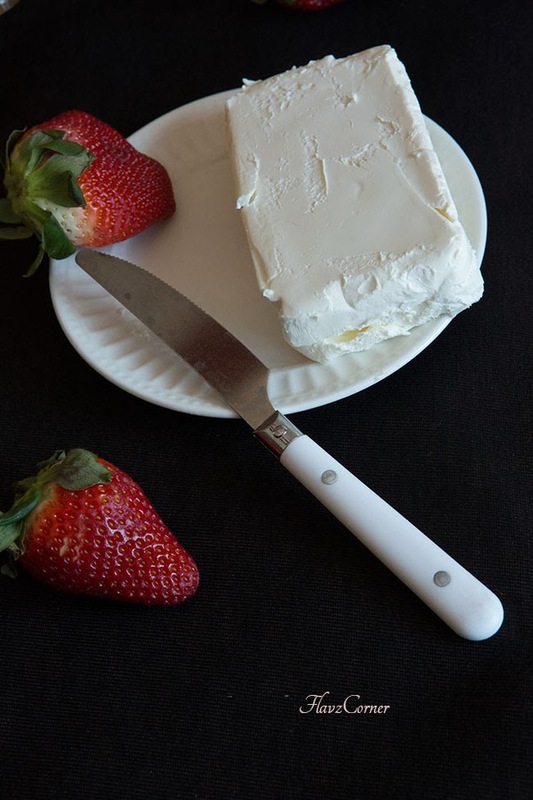 Using a wide spatula, lift up the cake from the base (including the parchment paper) of the spring form pan and transfer to the serving platter/cake stand. Pour 1/4 cup of mango puree over the cake and top with fruit pieces for the final touch. You don't need a spring form pan to make this, you could use a pyrex glass container or a cake pan to make this cheese cake. If you don't have a food processor to crush the graham cracker, just take the crackers in a bowl and crush it with the base of a heavy coffee cup that has a flat base. Don't forget to use wax paper or parchment paper to line the base and the sides of the spring form pan. This makes it easy to release the cake from the pan. Left overs can be covered and refrigerated. This cheese cake has the texture of a pudding rather than a firm cheese cake. Hi! Is there any substitute for Gelatin? I am a vegetarian! I had updated the post with the substitution for gelatin. Hope it helps. The cheese cake looks awesome Shibi. Glorious colour! I am a huge fan of no baked cheesecake, this is a perfect dessert. Wow!! cheesecake looks super delish... I feel so tempted looking at the pic..
That looks pretty and delicious. super delicious cheesecake. perfect yummy treat. Wow, this is gorgeous, and it sounds really delicious too. No bake? Yum yum! Lovely clicks and the beautiful velvety cake looks irresistible. Oh Shibi, it looks so gorgeous and I know it has to be delicious as well, mango, mango, I love it. Congratulations on your pictures, they are so beautiful! Mango? Cheesecake? Yes to both! This looks terrific -- such a great recipe. Blogging is supposed to be fun, so I'd post on whatever schedule works for you. Quality over quantity is my motto! ;-) But it's always good to see you post -- thanks for htis. 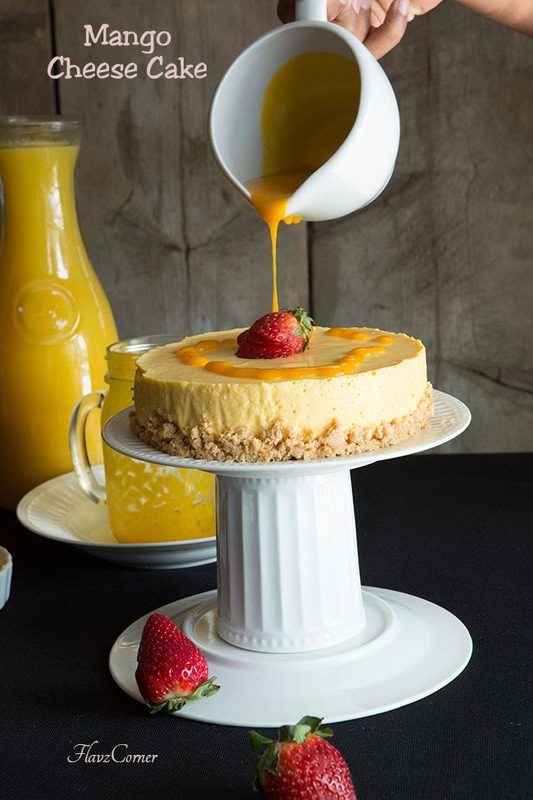 mango cheese cake looks delicious. Can't believe this is no bake!!! It looks SO good! 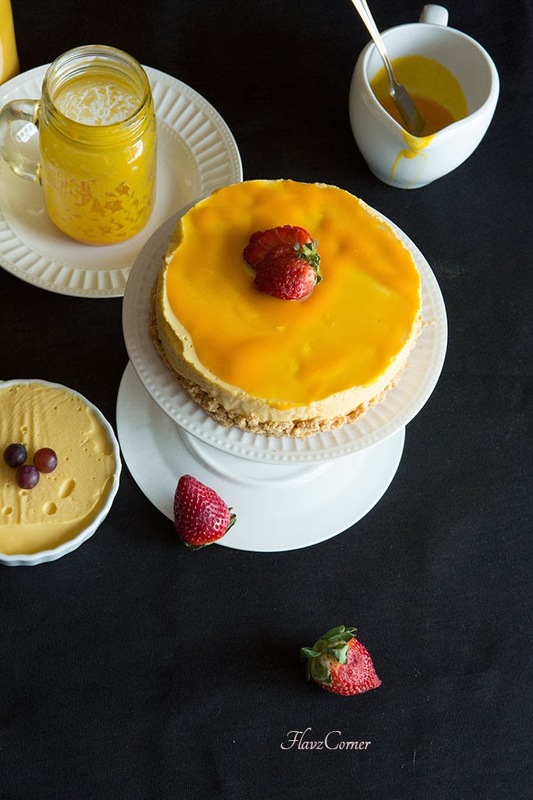 Loving the mango + cheesecake combo! cake looks fabulous. very Good presentation. Thanks Shibi for the yummy recipe. It tried it and came out so delicious. Graham crackers are lightly sweet crackers. They are used in several recipes likee cheesecake base, smores etc. You can substitute with digestive biscuits if you cannot find Graham crackers.